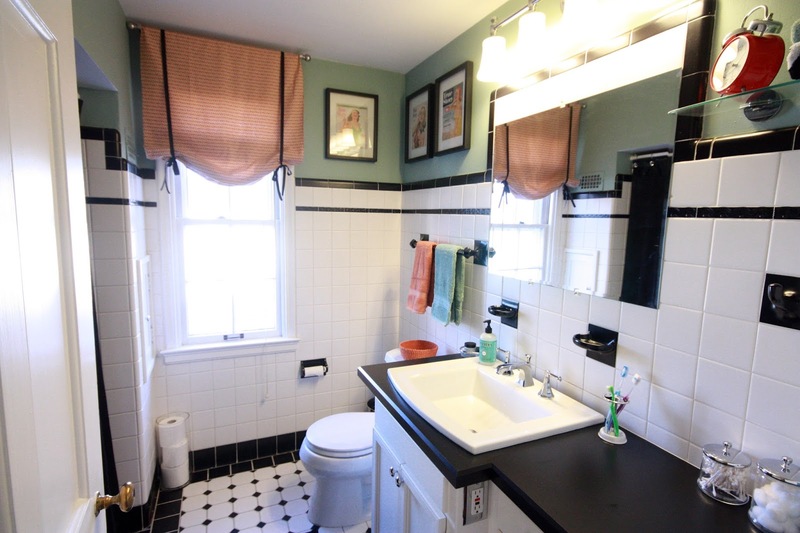 I feel a little strange still posting about the Russet street home now that we don't live there anymore, but I realized that I never showed you the main bathroom since that post back in 2012 when I said that before I went back to work from maternity leave I would be painting our bathroom. BAHAHAHAHA! I never did that. But I did do it last fall, and never told you. The Behr Swiss Coffee I was contemplating worked great with the tile. 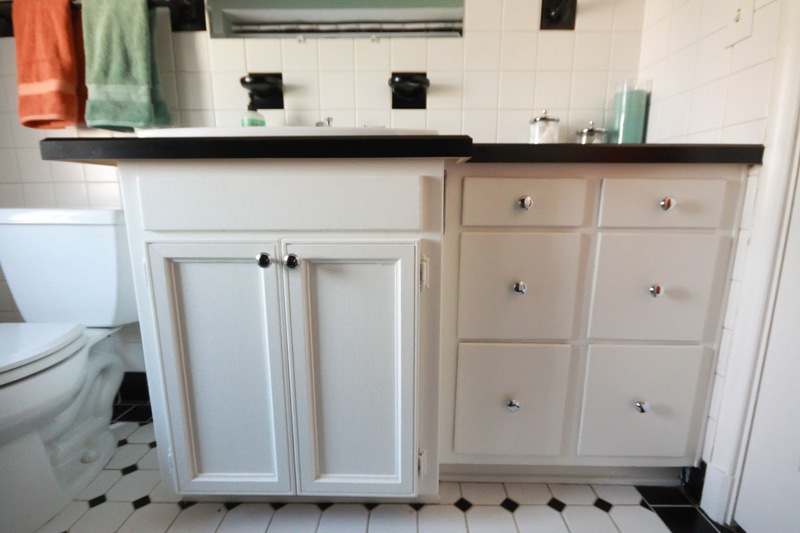 The previous cabinet was cosmetically unattractive, lots of missing paint and dings. The counter top was also, um....terrible. I had spray painted that old laminate top back in 2009 and while it held up surprisingly well with daily use, it was time to go. We got a new black laminate top from Home Depot with a pretty beveled edge, and a Kohler Archer drop in sink....this sink is huge and I loved it! 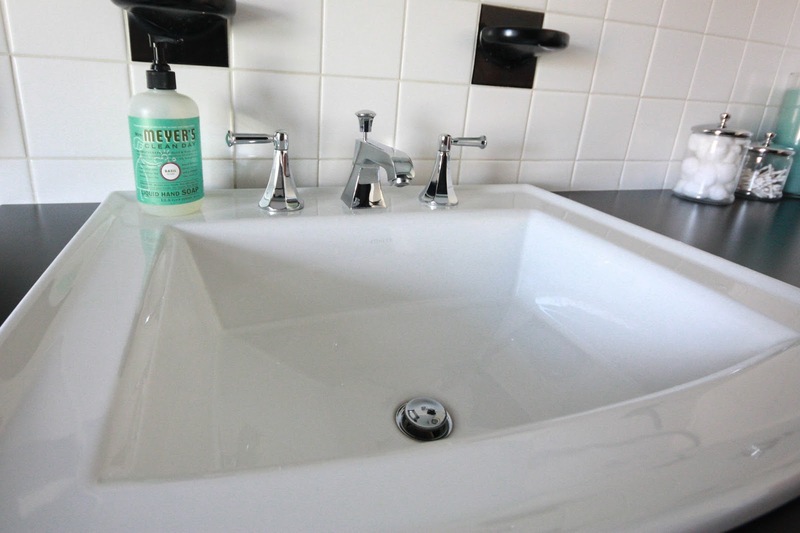 When we got the Kohler Memoirs faucet I've had for years installed, it was looking great! I spent some quality time with wood filler, sandpaper, BIN and the Swiss Coffee paint....and the vanity was looking new again. 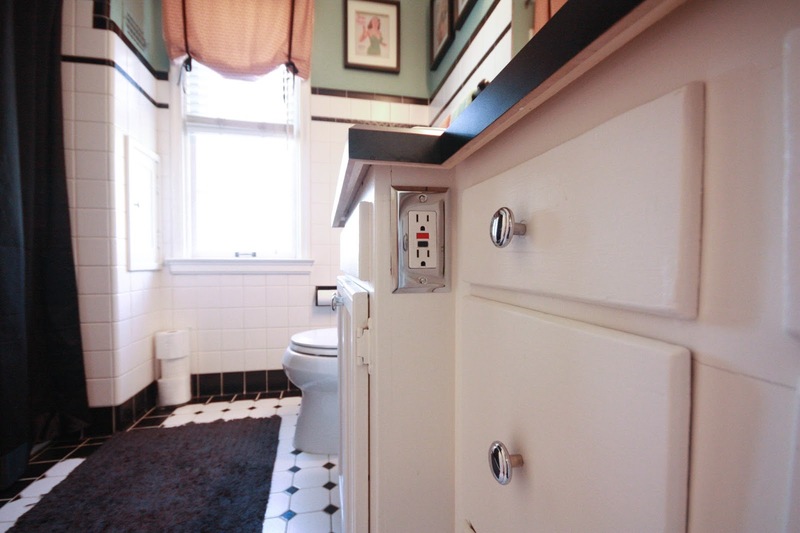 I also upgraded the outlet switch plates on either side of the main cabinet to chrome...little things like that really made a big difference. 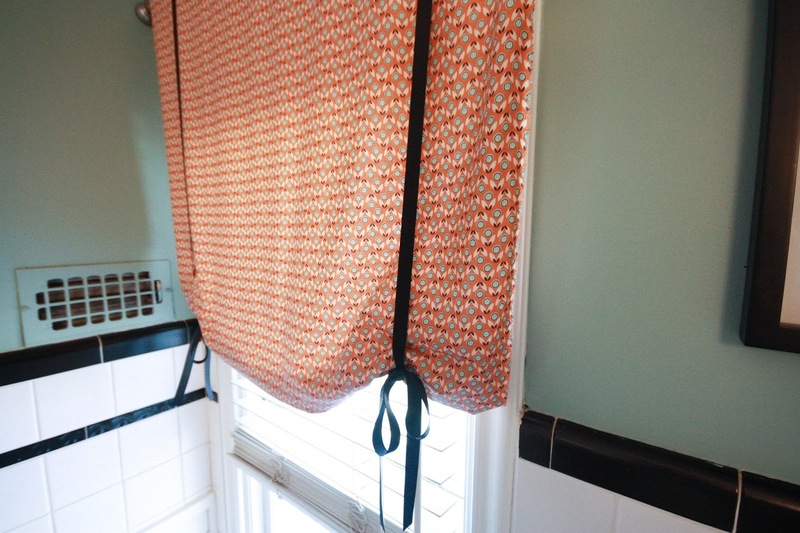 I used the same fabric from the walk in closet window to make a curtain in here, the black ribbon is just tied around the fabric to tie in all the black in the room. I love that fabric, it just works so well in here with the color and the vintage print. I also replaced the plastic towel bar on the back of the door with a nice chrome one. The orange Threshold towels from Target match the fabric color perfectly, another reason why Target is a minimum $100 store for me! 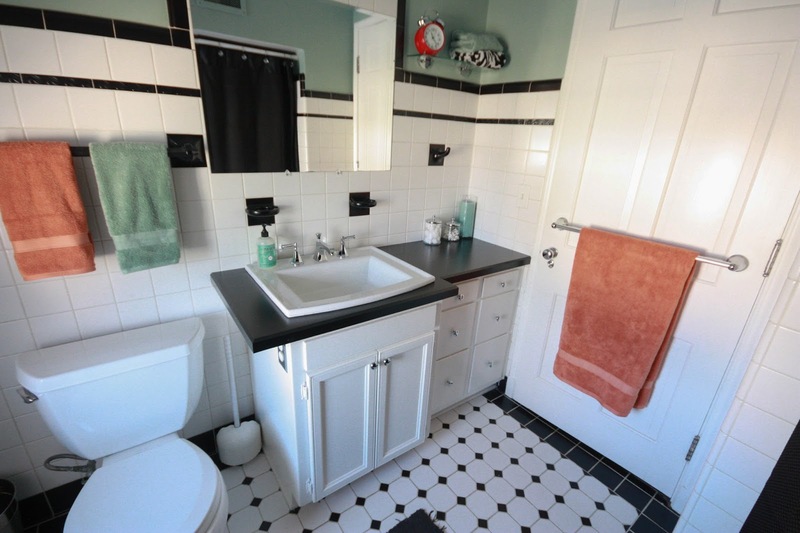 Overall, I am very happy with the way the bathroom turned out. I'm glad we got to enjoy it for 5 months before we sold. I will surely miss that vintage tile! SO glad they are replacing the roof - I would ask if you can pick the colors, can't hurt right? They may have a price point in mind but surely there are a few options in your price point! I'm happy to hear they're going to replace the roof! Congrats on that. I hope they let you pick the shingle colour too! Something tells me banks don't care too much about aesthetics.. It really looks awesome. I love the mixture of colors you chose - you always have a way of bringing colors together I'd never have considered. I am kind of shocked HOW much of a difference that one small change made in that room. Counter, sink, and paint and it looked like it took 30 years off the room. The vintage tile just pops. Good news on the roof! !